Chronic wounds caused by diabetes, poor circulation or other conditions affect about 6.5 million Americans every year, according to the National Institutes of Health, and keep them from enjoying their favorite activities. If you have a chronic, non-healing wound, the staff at the Center for Wound Care and Hyperbaric Medicine can help you get back to the activities you enjoy. Dedicated doctors and nurses specialize in treating non-healing wounds, including those that have resisted healing after months or even years of traditional treatment. Call 661-949-6946 for more information about the Center for Wound Care and Hyperbaric Medicine. Chronic wounds are those that have not begun to heal in two weeks, or those that have not completely healed in four to six weeks. The Center for Wound Care and Hyperbaric Medicine treats wounds associated with a wide range of conditions, including complications from diabetes and other related vascular disorders, cancer, trauma, surgical wounds, burns, infectious diseases and vasculitis. Acute or chronic conditions can often be prevented with early, advanced wound care intervention. The team at the Center for Wound Care and Hyperbaric Medicine uses advanced wound care protocols. Along with proper attention to nutrition, infection and other underlying medical problems, we achieve greater healing results. When you visit the center, the staff will examine your wound and ask you questions about your general health. After a thorough analysis of test results and your medical history, an individualized treatment program will be designed based on your specific needs. The program may include regular visits to the Center for Wound Care and Hyperbaric Medicine for treatment, evaluation and follow-up care. You may also be given detailed instructions on how to care for your wound at home. 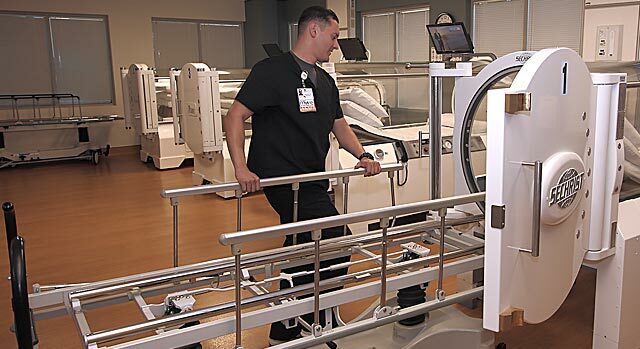 The staff at the Center for Wound Care and Hyperbaric Medicine specializes in treating wounds with HBOT, including those that have resisted healing after months or years of traditional treatment. During this therapy, 100 percent oxygen is administered in a pressurized environment. The therapy works throughout your entire body as the increased level of oxygen enters the blood and body tissues. Each chamber offers a private, comfortable environment, equipped with a television and DVD player for entertainment. Learn more about hyperbaric oxygen therapy for non-healing wounds and other treatment options for chronic wounds in this educational health podcast. Are your feet causing you pain? Does the pain in your feet limit your activities? Does it feel like you’re walking on broken glass? Are you concerned that diabetes could be affecting your feet? We specialize in advanced wound healing and limb salvage by utilizing the latest in skin substitutes and HBOT. There are 25.8 million people in the United States who have diabetes, according to the American Diabetes Association (ADA). Each year, more than 60 percent of nontraumatic lower limb amputations are the result of diabetes, according to the ADA. Damage to the foot’s sensory nerves, diabetic neuropathy, contributes to foot deformities and ulcers that increase the chance of lower-extremity amputations (LEA) unless treated. Call 661-949-6946 for more information.